We’ve been talking about the beauty of this forest, especially on a foggy day – and it occurred to us that hikers less familiar with it might want better information. 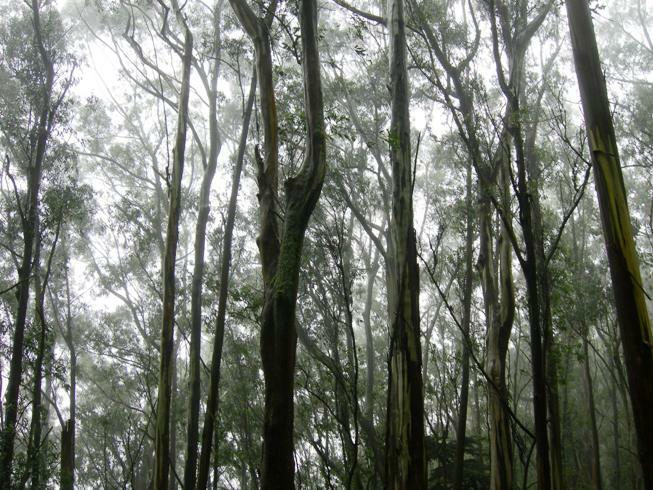 This article has been reprinted from Mount Sutro Forest. 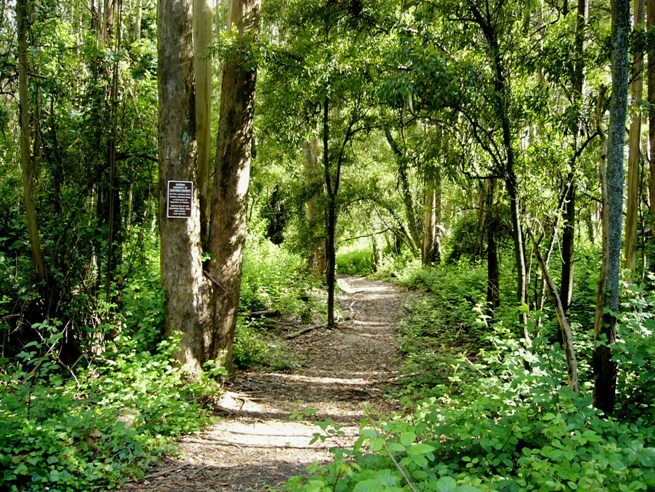 Hiking in Mount Sutro Forest is a different experience than almost anywhere else in San Francisco. It’s heavily shaded under the tall trees. Looking up at the trees, some of which are 100-200 feet high, really gives a sense of being in an old, wonderful place. On a foggy day, it may be the most beautiful place in all the city. 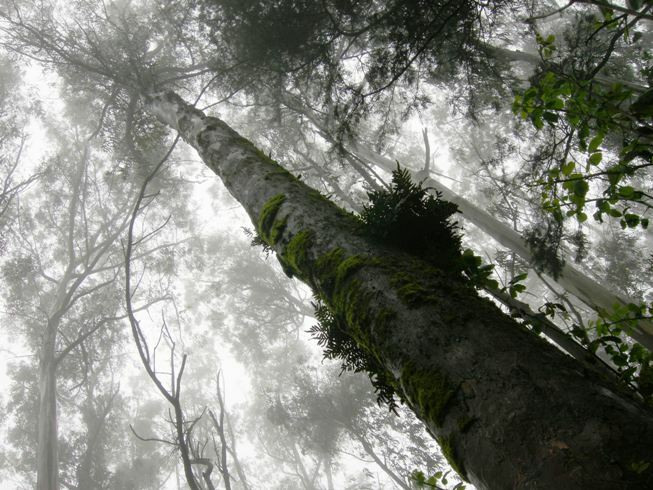 The mist wraps the tops of the trees towering overhead while you walk through the trails of a fresh wet forest in its self-contained rain. On weekdays, there are usually few people around, so there’s a sense of splendid isolation amid towering misty trees. Though we love best the days when it’s a mysterious cloud forest, sunny days are also delightful in the woods. Mount Sutro is on the western side of San Francisco (see the front page of this website for the location). It’s north of Clarendon Avenue, South of Parnassus Avenue. It’s accessible by public transport, though it’s a bit of a walk in from the nearest bus-stops. At 7th Ave. across from Garden for the Environment if you want to take the Oakhurst stairway up from Warren [through the Forest Knolls neighborhood] – this is a more vigorous trek though. Or get off at Stanyan, same bus, and uphill it to 17th & the upper Stanyan trailhead. 1. Stanyan and 17th. The trailhead starts with a wooden staircase about two houses above the intersection. The area has 2-hour street parking. 4. Edgewood. There’s usually neighborhood street parking somewhere there, and you can access the trailhead at the end of the road. 5. Belgrave. Neighborhood street parking with limited hours. This trail is quite dense; it brings you to the Aldea campus where you can take various other trails. A number of trails go into the woods, from various points around the mountain. Carry a trail map with you, at present there are no maps at the site, though trail markers have recently been added (2010). 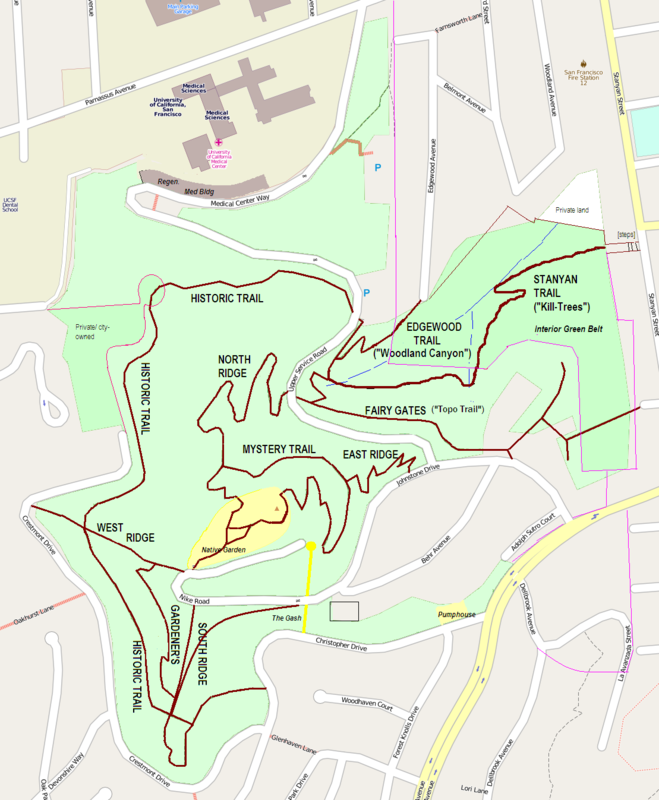 There’s a more detailed Sutro Forest trail map (as a PDF) here at Pease Press Cartography. If you are looking for the ethereal cloud-forest experience, pick a foggy day in summer, and go for trails such as the South Ridge Trail, and the top part of the Historic Trail. As a general rule, look for areas where the undergrowth remains dense and the tree canopy exists. Narrower trails (the fainter lines in the map above) are more atmospheric. The lower part of the Historic trail is quite dry especially around the area where it changes direction from North to West (going downhill). The Fairy Gates Trail, which runs below Medical Center Way past the Chancellor’s house, is one of the driest – it is often dusty even in foggy weather. From the Clarendon Avenue side, trails start within the Forest Knolls neighborhood (street parking) and UCSF’s Aldea Student Housing (no outsider parking). The Fairy Gates trail starts just outside the Chancellor’s house on Johnstone. The East Ridge Trail starts opposite the new community center (under construction) further up on Johnstone. From Forest Knolls, two trails offer a steep climb up to a cloud-forest environment. The West Ridge trail opposite 365 Crestmont. Medical Center Way, the paved road joining the Aldea campus to Parnassus Avenue intersects a number of trails. If you’re starting at Parnassus, you can also climb the steps from the bottom of Medical Center Way to the Surge Parking lot. There’s an unnamed and rather unexciting trail starting on Farnsworth (very limited street parking), at the north end of Edgewood, going through the Surge parking lot. Mainly, it will get you to Medical Center Way. Waterproof shoes. It’s almost always damp in there, even on a sunny day. This is a Cloud Forest, and it lies in the Fog Belt. Even if it’s sunny downtown, or outside the city, it may be misty in the forest. Or it may have been cloudy overnight, with the forest’s internal rain falling through the night. On a foggy day, slush on the trails is normal and unavoidable. Wear shoes that can cope. There aren’t many puddles, even on a foggy day, but some of the trails get very wet and muddy indeed. However, the trails vary greatly in how wet they are. The Stanyan “Kill-trees” Trail is quite dry even on a foggy day, as is the Fairy Gates Trail. Long pants and long-sleeved clothes. It’s seldom warm enough to be comfortable in short-sleeved clothing. It also helps against poison oak. On foggy days, dress warm and wear rain-gear. Even if it’s dry outside, it will be raining in some areas of the forest. Allow for mud. If it’s a foggy day, clothes can get muddy. Especially if you kneel down to get photos like the one above. Stay on the trails. This protects both the forest, and the hiker. Poison oak is an issue. Though not as rampant as in more sunny areas, it is also more difficult to spot amid the greenery. Careful on wild trails. In addition to the named trails shown on the map above, there are a few “wild” trails that are maintained little, if at all, and may dead-end into impassible greenery. They aren’t suitable for bike riders, but for someone interested in a wilder experience, these may be interesting to explore. Caution: some of them will have poison oak. Careful on very stormy days. Many times, when it’s windy on the bare hills like Twin Peaks, there’s not much of a wind in the forest; the trees block it. But if it’s stormy, there could be falling branches – especially in more open areas of the forest and along the edges. The trails are suitable for older kids, not so much for very little ones who may want to be carried. Some trails – especially Fairy Gates – have steep edges and drops. There’s no stroller or wheelchair access except the paved Nike Road up to the Native Garden (the garden itself has gravel paths, not paved ones). This entry was posted in Maps, Mt Sutro Cloud Forest and tagged cloud forest, mount sutro, Sutro Forest, trails. Bookmark the permalink. 1. Sand was indeed the main topic. but several of us there still are highly concerned that the topic of playground placement was hardly touched. 2.The topic of tennis court re-placement is extremely important. Brushing it off, the program director simply said that they would (will) be placed where Alms Drive is now. That would cause the destruction of at least 9 sturdy, 100-yr old healthy, perfectly good (eucalyptus) trees. We are certain that there has been NO EIR presented to us. Without a doubt, removal of healthy, older trees would be included in such a report. It seems as though the architects have simply ignored this absolute requirement. She told me that “they” (the architects committee?) had decided that it would be too expensive leaving the trees to carve out the hill above Alms to put the tennis courts there. What she didn’t say is that the site of the trees must also be bulldozed and costly root removal done! THERE MUST BE A HEARING ON THIS TREE SITUATION–WITH THE ARCHITECTS (not their flunkies) AND PROOF THAT THEY HAVE OBSERVED ALL EIR REQUIREMENTS. Some years ago I was a member of the Department of Pharmaceutical Chemistry at UCSF, living only 3 blocks down Clarendon. I walked to work through the Sutro Forest, but needed a good trail to stay away from the curvy Medical Center Way. I located an abandoned trail cut though the forest (possibly by the original woodcutters in the 1920s). Poison ivy, brambles, washouts, and standing water puddles were dispensed with, giving me and student housing residents a remarkable trail (ca.1975). I maintained it until 1996 and dubbed it the Topo Trail, owing to its level nature. It runs N from the chancellor’s home to the Way, where it is alongside the road. I see that the silly term “Fairy Gates” has been given it. Please change. The name has been formalized as “Fairy Gates” on the signposts installed by the Sutro Stewards and permitted by UCSF… but we can add “Topo Trail” on the maps we publish here. Thanks for this little bit of its history! Can I put one of your photoes on Instagram?